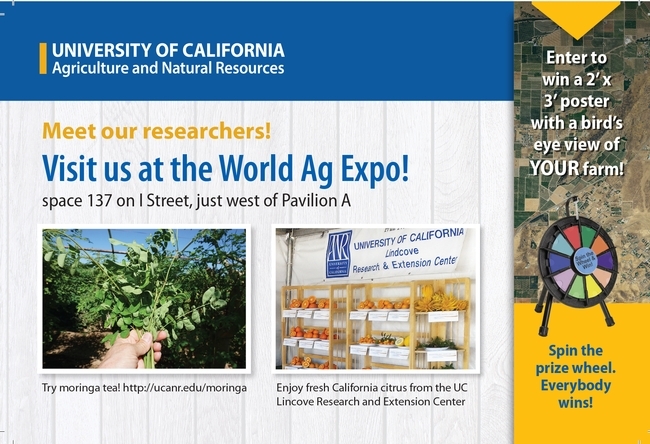 Attractions in the UC ANR tent at space 137 on I Street, just west of Pavilion A, include the opportunity to meet researchers, enjoy fresh citrus from the Lindcove Research and Extension Center, taste moringa tea, and enter to win a poster-size satellite image of one's own farm. 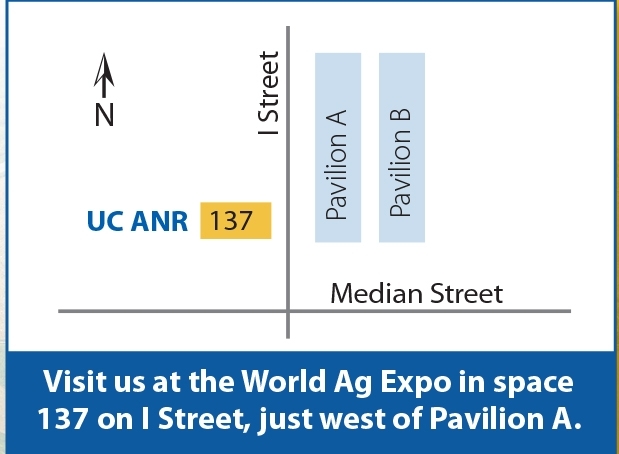 TULARE, Calif. — The public is invited to taste, see and learn about many UC Agriculture and Natural Resources programs offered in California at the World Ag Expo, the world's largest agricultural exposition to be held in Tulare Feb. 12-14. The Expo is at the International Agri-Center, 4500 S. Laspina St., Tulare. The tent displays include leaf-footed bugs controlled by microbes, traps for managing vertebrate pests, the superior quality of soils managed with conservation techniques, and high-tech ag innovations, including a drone. In two booths inside Pavilion A (1411 and 1412), the UC ANR programs that target the general public will be featured. The Tulare County nutrition educators will be playing nutrition Jeopardy! with visitors. The UC Master Gardeners will reach out with research-based gardening information. The 4-H Youth Development program will invite all youth to peer into virtual reality goggles to give them an idea about the fun activities that can be part of joining 4-H.
With VR goggles, viewers can be immersed in expeditions from Mount Everest to the undersea world. Expeditions explore history, science, the arts and nature. World Ag Expo visitors will have the opportunity to experience a variety of virtual experiences, from scuba diving with sea lions to flying over Greece. Two UC ANR academics are presenting seminars during the the show. Mitloehner will discuss confusion in the media about the impact livestock supposedly has on our environment. This presentation reviews how the efficiencies in livestock production and environmental emissions are related, and how our producers are leading the way to a “greener future” for California and U.S. agriculture. 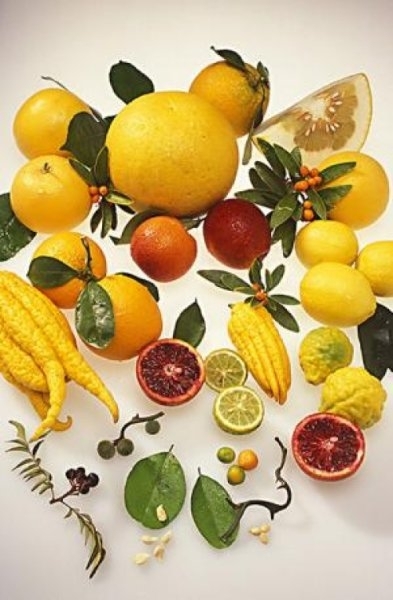 An update on regulatory protocols relating to Asian citrus psyllid and HLB quarantines and the proper transportation of bulk citrus to mitigate against the spread of the pest and disease. 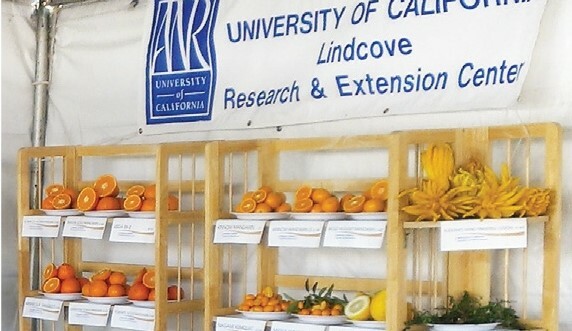 Speakers will review the University of California recommended treatment options for Asian citrus psyllid in commercial citrus groves and residential citrus trees. Continuing Education units have been requested. The California and Dutch AgFoodTech innovation partnership is reuniting in California during the show to share their action plan and scope the projects. Contact Gabe Youtsey, UC ANR chief innovation officer, to request an invitation to the presentation and networking luncheon on Feb. 12 at the UC Cooperative Extension office across the street from the International Agri-Center in Tulare.